Hi ladies! How was your weekend? Mine went by FAR too quickly unfortunately. 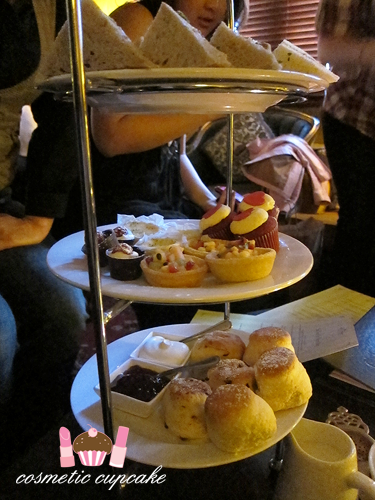 I had to reschedule my plans for Saturday as I needed to rest up but my ankle is feeling so much better now so it was worth the sacrifice x) Yesterday I had the pleasure of attending a blogger meet up along with 14 other Sydney beauty bloggers for a spot of High Tea at The Victoria Room in Darlinghurst. I decided to go for some pretty pink nails to fit in with the occasion! Pinky: 2 coats of China Glaze Something Sweet with full floral image from Konad plate m71 using China Glaze Admire. Ring finger: 2 coats of OPI Alpine Snow. I then created a rhinestone bow using silver and pink rhinestones. Middle finger: 2 coats of China Glaze Something Sweet topped with 2 coats of the amazing Deborah Lippmann Glitter in the Air. The pastel blue base of GITA turned the pink base somewhat lavender-ish which was kinda nice! Thumb: 2 coats of China Glaze Something Sweet as a base. I then freehanded a French tip using Eyeko Chi Chi polish and added silver glitter to the smile line using Kiss nail art striper in silver glitter. I love high tea but I’ve never been to The Victoria Rooms so I was looking forward to trying it out. Unfortunately I didn’t take too many photos because the Victoria Rooms is just SO darned dark which means photos turn out crappy. The lack of light is all part of the ambiance I’m sure but I like to actually see what I’m eating and who I’m talking to! The food was delicious and the company was great though. We also did a little swap and I picked up a few goodies which was nice! Big thanks to Sara-May for organising it! 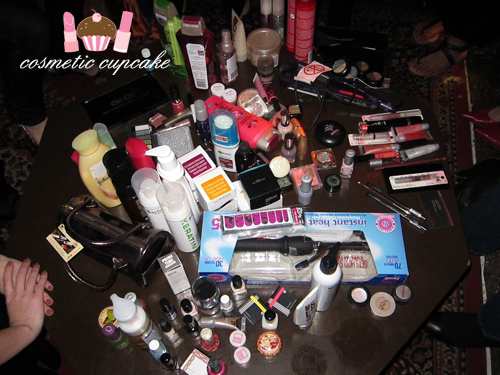 Can’t wait for the next meet up =) What did you get up to on the weekend? Also, happy 4th of July to my US readers!! Your nails are SO cute, and oh my what a swap! Your mani is so cute! And I want to eat these cakes!! Your nails are just a gorgeous mix of everying . Your nails are absolutely amazing and pretty! "my mani actually looks better in my pics than it did in real life!" lol, you are so funny! Do you use a paint brush to free hand your tips or just the nail polish bottle brush? I am loving this cute manicure! Love you mani! It's so pretty! How'd you do the lace-like design on your index finger? Oh your manicures are always so cute and feminine ! this is so pretty!! i like it! Ooooh and it seems you had a fab day my dear!